Manchester United manager with a trophy on Sunday as Zlatan Ibrahimovic‘s late header beat Leicester in the FA Community Shield at Wembley. Jesse Lingard, who scored the final goal of the Louis van Gaal era with the winner in the FA Cup final against Crystal Palace, had put United ahead before half-time. He had ran 40 yards and beaten four men to slot home. League champions Leicester replied when Marouane Fellaini‘s dreadful backpass let Jamie Vardy in to round David de Gea and score. But summer signing Ibrahimovic typically had the final word with seven minutes to go, rising to meet Antonio Valencia’s cross and beat Kasper Schmeichel via the post. The Swede had stated beforehand that the shield would be the first trophy he would be bringing home as a United player, and so it proved for the veteran striker. Leicester had brought Mourinho’s second stint in charge of Chelsea to an end with a 2-1 defeat at King Power Stadium in December on their way to the title. But this was a much happier occasion for the Portuguese. Mourinho has even more reason to be cheerful ahead of the start of the new Premier League season next week. 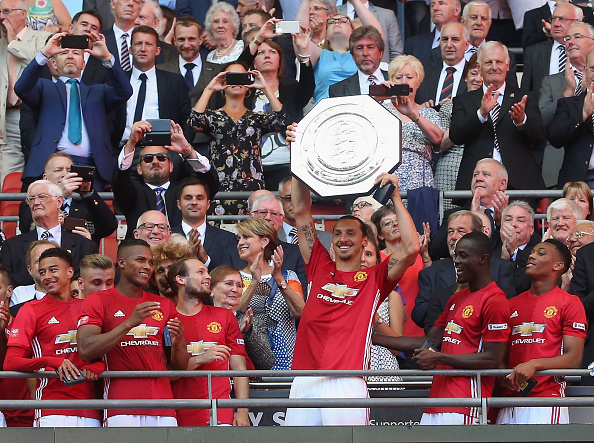 Hey Buddy!, I found this information for you: "Zlatan Ibrahimovic lifts Community Shield Cup". Here is the website link: https://360kwado.com/zlatan-ibrahimovic-lifts-community/. Thank you.